Nancy Didick of Wrentham, Massachusetts, traveled a lonely road when her 35-year-old son, Kevin, was struggling with drug addiction. He died September 18, 2016, from an opioid overdose of heroin laced with fentanyl. Almost a year later, she and her husband still knew no one who’d lost a child to opioids. Even when she phoned to join a support group, no one called her back. But Didick’s despairing isolation ended in August when mysterious yard signs started cropping up in her town with a cryptic message: #2069. Curious, she plugged the hashtag into a search engine and found the community she’d been seeking. She landed at the #2069_signs Facebook page, where those affected by opioid addiction in southeast Massachusetts and beyond have begun coming together, finding resources and offering support. 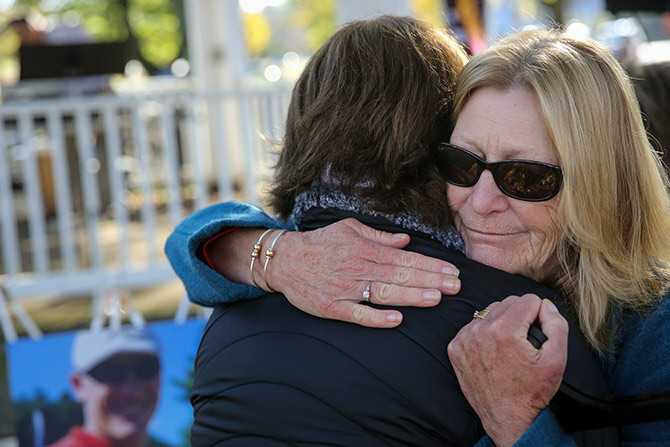 Nancy Didick, who lost her son to an opioid overdose, gets a hug during a rally on the Town Common in Wrentham, Massachusetts. The campaign was designed both to make the epidemic visible and to create a way for its surviving victims to find each other. And it was conceived not by substance abuse experts or social media gurus but by a rural mainline Protestant church with peeling paint and about 50 worshippers on an average Sunday. What could your organization do to help welcome the broken, even without a lot of resources? The campaign began with two dozen signs in a storeroom at Trinity Episcopal Church in Wrentham and an experimental Facebook page. It has mushroomed into an online community of more than 1,125 members, brought together by more than 1,100 planted yard signs around the state and a series of fall events at Trinity, where online friends get a chance to meet in the flesh and make new connections. Dozens of signs line the streets of Wrentham alone (pop. 11,253). Bonnie Myers places #2069 signs during the "No Shame, Erasing the Stigma" rally. The campaign is capturing widespread attention, in Boston newspapers, on radio and TV stations and beyond. Observers see in it a promising example of an increasingly relevant, church-as-convener model for social action. Rather than make moral proclamations or trumpet political solutions for the opioid scourge, Trinity has focused on gathering people -- first online, then in person -- to be visible, to network without a specific outcome in mind and to receive assurance that they are loved. Playing the role of convener isn’t new for mainline Protestant congregations. Many have deep roots and civic ties in their communities, sometimes dating back centuries. When social crises erupted in generations past, these churches often anchored their communities’ hunt for solutions, according to Nancy Ammerman, a sociologist of religion at Boston University. But Ammerman sees the convener model taking on a new dimension and deeper richness in the #2069 campaign. By stretching the concept of gathering space to include cyberspace, Trinity is opening a door in a realm where people routinely gather and learn anyway. Congregations with traditions of being network hubs, she said, can learn from Trinity how social media can enhance that role. Do you take seriously the role of "church as convener"? What would that look like in your context? 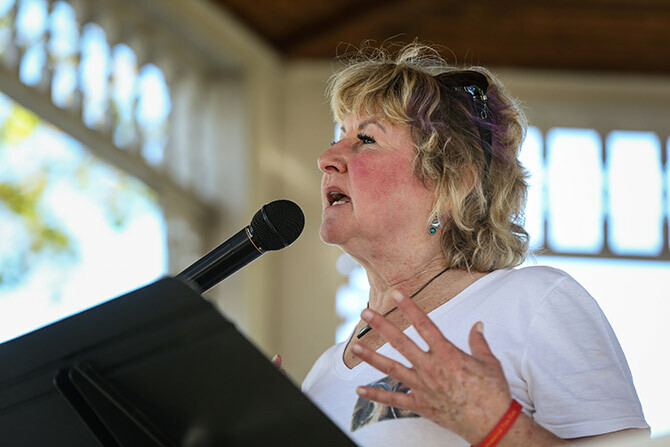 “These congregations now are saying not just, ‘Let’s have a meeting of the local ministerial alliance’ but ‘Let’s put these yard signs out, connect via hashtags and get the word out to people who might not be darkening the doors of the congregation at all,’” Ammerman said. What’s more, observers say, in America’s tense social and political atmosphere, the time is ripe for churches to reclaim and reinvent their traditional convener roles. Even in an age of leeriness toward religious institutions, churches can leverage and even grow their stature in a community by facilitating public conversations that other types of institutions can’t deliver, according to Libby Davis Manning, the associate director of the Wabash Pastoral Leadership Program at Wabash College in Crawfordsville, Indiana. The idea for the #2069 campaign took root this past February, after the opioid crisis, which affects more than 11 million Americans and kills tens of thousands each year, hit close to home at Trinity. Church member Joe Wencus shared tragic news: his 33-year-old son, Jeff, had relapsed during rehabilitation and died of an overdose. Only then did Joe’s friend Jim Derick, a fellow church member, realize they’d both been struggling with the same problem for years -- an adult child in the throes of addiction -- yet never talked about it. 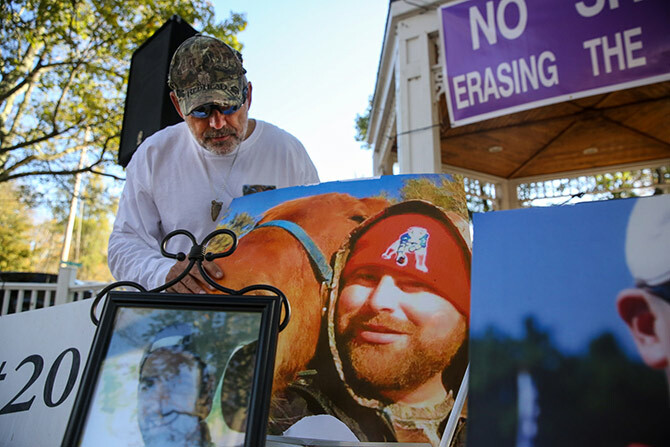 Joe Wencus places a photo of his son -- who died of an opioid overdose -- on a table during the rally. After Jeff Wencus’ death, Trinity’s outreach committee felt a call to address the crisis locally but wasn’t sure how. Derick gave a presentation on the scope of the crisis. When he shared the Massachusetts death toll, committee members gasped. That gave Tibbetts the idea of using the shocking 2069 figure to raise awareness. Perhaps it would awaken a sleeping giant in the form of suffering local families who hadn’t met each other yet. But not everyone was convinced they had a winning idea on their hands. 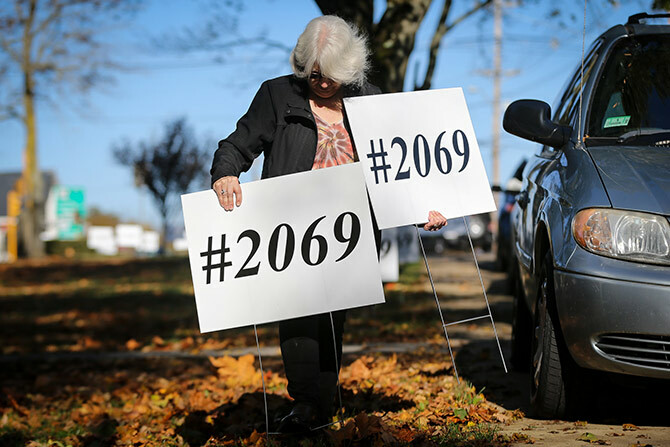 At first the #2069 signs seemed like a gimmick, even to some people affected by the epidemic. Are there strategies you are rejecting because they seem gimmicky or tacky? Because the campaign promoted no political or religious agenda, S.A.F.E. Coalition agreed to partner with a faith community for the first time in its history, Derick said. The nonprofit bought the first 25 signs for Trinity at a cost of $12 each. Two hours after the first ones were in the ground, the Facebook page was filled with queries. Organizers realized that they had struck a chord. The signs functioned in the manner of a dye that brings visibility to something formerly unseen. They started cropping up all over Wrentham, in wealthy and modest neighborhoods alike, signaling that all these homes had been touched in some way by opioids. Suddenly, the town’s pain came to light on a scale impossible to ignore. “It gave them power and a sense of identity” to display signs and have a place to meet online, Tibbetts said. Within two weeks, 63 signs were in the ground. Demand kept growing as online visits and local news reports explained what the mysterious number was all about. The movement spread to nearby communities as churches and others volunteered to help distribute signs. By mid-October, some 15 distribution sites, some in the far western and northern reaches of the state, were helping Trinity get the signs out. This fall, Trinity added another layer by organizing physical meetups. The goal: to help those who had connected with each other online connect in person, with friends and with God. At a September meet-and-greet event at Trinity, prim and proper churchgoers did their best to make tattooed young adults with neon-dyed hair feel at home. It worked. The rally was intended to gather a virtual community that started on Facebook. About 90 had turned out for a chance to network, swap tips and feel accepted. Near the end, one person asked to use the sanctuary for prayer. Everyone was invited into the space, Derick said, and upwards of 40 people prayed. Offering spiritual experiences for anyone who’s interested is an important aspect of the campaign, Tibbetts said. A few weeks later, when Trinity hosted a rally on Wrentham Common, about 175 attended. A few exhibitors handed out information. Police officers turned out to show support. Facebook group members listened to testimonies from survivors, first responders and elected officials. Lynn Wencus speaks about the experience of losing a son to an overdose. 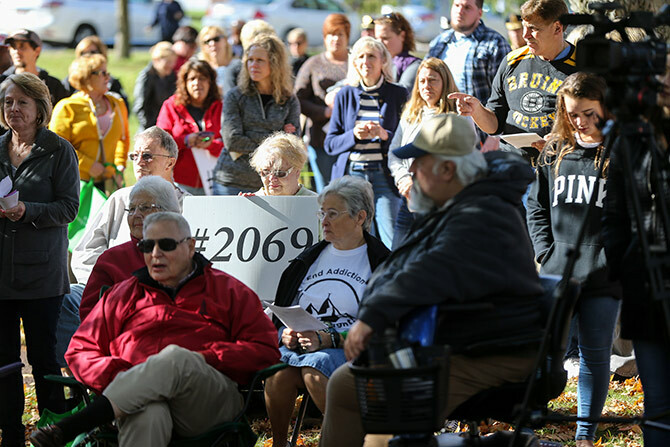 A third #2069 event this fall will open the church once again for a lay-led prayer vigil. At each event, the congregation has made a point of giving visitors space to engage on whatever level they’re comfortable with, Tibbetts said, and let the fledgling community discover its own needs and discern next steps. Tibbetts said he hopes other churches will hop on the yard-sign-to-online bandwagon for mobilizing social action. All it takes is one compelling statistic that makes people wonder. Why not print signs, he suggested, announcing the number of homeless individuals in your community? Or the number of local children who go without breakfast every day? The possibilities are endless, he said; just don’t forget to include the hashtag so it can be searched online. In tackling a local problem by helping the afflicted and the experts learn from one another, Trinity is joining an emerging tradition of faith-based, collective problem solving. Faith-based conveners, experts say, need to be intentional about overcoming certain tendencies in ministry. Pastors are used to having answers at the ready, Wabash’s Manning said, and they tend to get “paralyzed” when they don’t have an action plan to offer. Are you willing to take part in a conversation even when the solutions aren't clear? The convening model requires them to override that tendency, trust in the community’s collective expertise and let public conversations begin, even while a problem’s roots are still coming into focus and potential solutions may still be unknown. Trinity aims to ride the momentum of what has been a four-month whirlwind into 2018. The congregation is freshly energized by the campaign and the uptick in worship visitors who say #2069 got them interested in attending. In terms of further outreach, the church is considering hosting seminars for parents on how to talk to children about opioids. Other ideas include helping launch a local sober house, hosting a regular community meal and operating a monthly drop-in center for anyone coping with opioid-related issues. What are the issues that your community does not speak about? Are you willing to take part in a conversation, even when the solutions aren't clear?